Spectacular Bride Magazine has been the engaged couples' favorite resource for planning a Las Vegas Wedding for over 25 years! Each Quarterly issue features Real Las Vegas Weddings, fashion trends, and fabulous wedding decor ideas. You will also find information about reception venues and all the services needed to plan your wedding. In addition, in the back of the magazine you will find a handy wedding planning section with all the tips to help you create the day that is uniquely yours. Happy wedding planning! You can pick one of our magazines up at hundreds of locations around Las Vegas or you can order one online CLICK HERE. You can also see many of the Real Weddings featured in our magazine by visiting SpectacularBride.Com. When planning a wedding you want to meet your prospective vendors face to face before making a decision, the best way to do that is at the next Bridal Spectacular Event. For over 28 years we have been helping brides plan their weddings at a two day event! Now located at two beautiful new venues, where you will find everything you could possibly need. Park in the Platinum Lot on Swenson and Desert Inn. The Convention Hall we are in faces Swenson. Vegas' Ultimate Wedding Planning Experience. 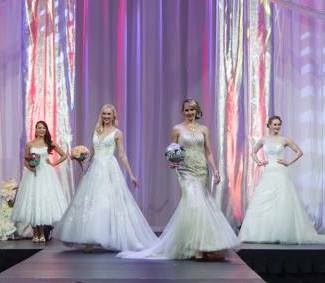 Find absolutely everything you need for your wedding, taste wedding cake, see a fashion show. Visit both ballrooms to meet over 150 wedding professionals. VIB tickets include a Spectacular Bride, Groom or Spectacular Bridal Party T-Shirt and VIB seating at the fashion show is only available if you arrive 20 minutes early. Seating is limited and your bridal party may be split up. Please wear your T shirt or carry it with you so we can identify VIB attendees. Register for chances to win fabulous Grand Prizes and over a hundred door prizes. Follow our Fan Page for special savings and Promo Codes and more details as show time gets closer. Can't wait to see you there. Las Vegas wedding service providers.